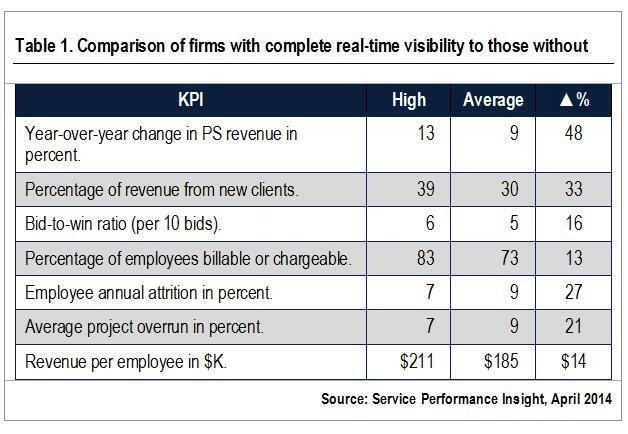 In the most recent benchmark, 238 professional services executives shared the level of information visibility they had across their organization. 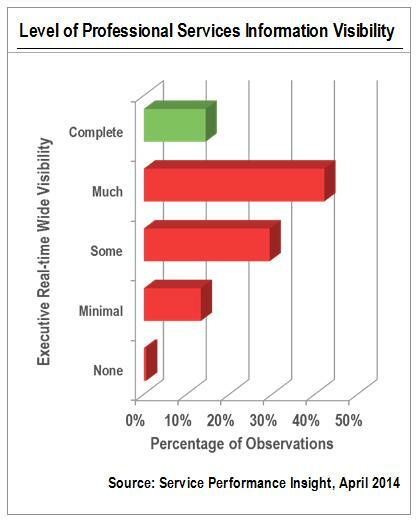 The figure shows that approximately 10 percent said they had complete information visibility for making decisions in real time. Still, what does this do to improve the bottom line in professional services? We decided to consider only those 10 percent of the organizations (about 30 firms) who said they had complete information visibility and compare them to the rest. Table 1 highlights a few differences. When an organization grows and expands the client base faster, it also improves in other aspects. Employees want to work for fast-growing organizations because they feel secure in their jobs, and they should be able to take on more responsibility, learn more and get paid more as they move up within a growing organization. Because these organizations expand faster, there’s less time for administrative overhead. As a result, the percentage of billable time increases significantly. This leads to a much higher revenue yield per employee of over $25K annually. Higher per person revenue helps the organization expand and grow profitably. No one wants to work for an organization that faces financial challenges or loses market share. Clearly, having real-time visibility for making business decisions does improve the bottom line. In the next post, we’ll look at how to improve real-time information visibility and the impact of real-time information on goals. If you’d like more information on how service organizations can use a professional services ERP to improve their real-time visibility, watch our recorded webinar now. R. David Hofferberth, P.E., is Founder and Managing Director for SPI Research and has championed solutions for the professional services sector for over a decade. In addition to providing guidance for hundreds of Independent Software Vendor (ISVs) clients over the years, SPI’s ongoing work with business and technology media enables their clients to remain informed and in front of the buying public. Hofferberth regularly consults with Professional Services Organizations and financial institutions.